Brainstorming during the Installation Infrastructure Visioning Practicum session here, Jan. 21-23 (left to right): Mark Reeves, safety specialist with Garrison Safety Office here; Ben Zitelli, senior master planner with the Louis Berger consulting firm, and; David Weatherman, chief of Master Planning with Directorate of Public Works here. 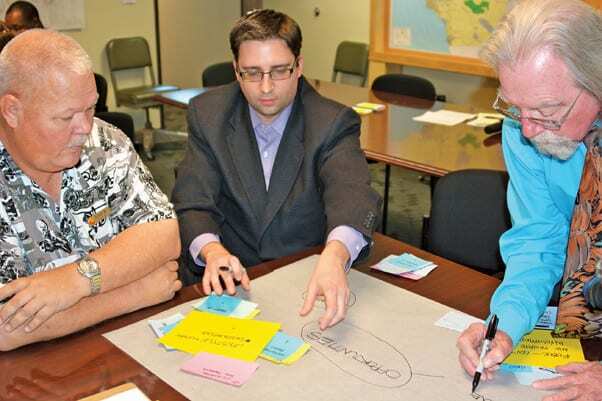 The Real Property Master Planning Division, Directorate of Public Works, hosted an Installation Infrastructure Visioning Practicum here, Jan. 21-23. The hands-on workshop developed a vision plan, which lays the foundation for the installation’s real property master plan that will be developed over the next six months. The visioning practicum was facilitated by Maureen Goodrich, master planner with United States Installation Management Command, and the Louis Berger consulting firm, who brought their expertise and experience of master planning to the table. 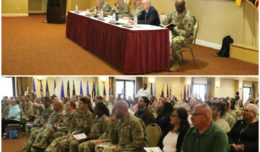 A week prior, Louis Berger staffers met with various Fort Irwin community members and asked quality-of-life questions, which fed into the visioning practicum to get an overall sense of the community’s concerns. The visioning practicum started with a visual survey, an exercise to develop an eye for aesthetically pleasing architecture, which led to a brainstorming breakout session to analyze what the current infrastructure strengths and weaknesses are on the installation. After the break-out session, the group was able to define objectives and goals for the future of the installation’s infrastructure. “The goal is to build facilities that are not meant for a single purpose, but to build to support any mission requirement,” said David Weatherman, chief of Master Planning with DPW. 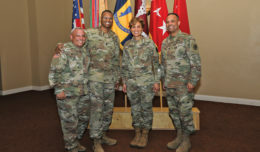 Members of the workshop were from several local organizations including Fort Irwin United States Army Garrison, 11th Armored Cavalry Regiment, U.S. Army Medical Department Activity and the 916th Support Brigade. 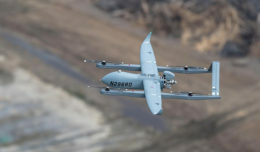 The group will meet again in the next few weeks to construct an area development plan for the south-eastern quadrant of the cantonment, home to the United States Army Materiel Command and the 916th SPT BDE, according to Weatherman. Directorate of Public Works attempts to efficiently and effectively sustain environment, infrastructure, land, structures, utilities and other real property within available resources. The DPW’s Master Planning division sustains the installation design guide and comprehensive urban planning, real property management, space utilization management, real estate services and executes real property planning.